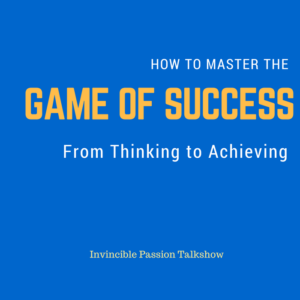 IPTS0011-How to master the game of success? 1. Who are you? What are you meant to become demands knowing what is your passion, what is your true calling? Once you know that or you have figured it out, honor it with integrity, not because of convenience. There is something that brings the shine to your light, to your power and that is what is a definitive sign from the Universe about your calling. Who are you meant to be? Follow your passion because if you do what you love, it will not only fulfill your cup but allow you to fulfill others too. Now the key is to just remind yourself of who you are. As Oprah says "You can either see yourself as a wave in the ocean or you can see yourself as the ocean." 2. Purpose-Thinking is part of dreaming- but realizing that dream depends on its purpose, significance and how it serves others. If you follow that, that is what I call living with intention, living with purpose.This purpose of serving is what helps you make a difference. This is the key to mastering this game. Or should I say HACKING this game? Mark Zuckerberg says “Find that thing you are super passionate about." 3. LUCK/DESTINY- UP until some years back, I would have said different about luck but after living and helping others grow in their own success with NUMBERS, I have a strong opinion about its existence. I believe luck is being at the right place at the right time. Oprah says” I feel that luck is preparation meeting opportunity.” This preparation came to me in trying to hack the science of numbers. While World is trying to hack the DNA and human cell mystery by genetic engineering, I kept trying to hack how this DNA of LUCK works. What is the mystery and how is the genetic engineering of LUCK designed? The numbers science says it all. This passion has brought me to you and how every name, every success, every failure, every delay is as per the plan, bigger plan and numbers tell it all. You can find more about numbers on my social pages with Twitter, Facebook, Pinterest, Instagram and on my blog- InvinciblePassionTalkshow. 4. Provision- Now you can call it by any name such as fame, network, net worth, power, rich, wealth, or financial freedom but it’s all about finding that point and stability in life, where you don’t have to worry to be living from paycheck to paycheck. But the problem is not having the solution to that stability in life. If you are chasing your provisions, then you will find that you are always just chasing and never able to have it. The mantra to having a life that is not only full but overflowing with the provisions is taking responsibility and shifting the focus from serving your needs to serving others. YES…because it is true that initially, you will be able to do your job but the moment you do your job well enough and the moment you do your job beyond well enough even, that is when you are ready to hit the jackpot called success. But you may ask how can I serve others and bring them fulfillment when my own cup is empty? Financial success and emotional success is different. Now provision is the fuel to help you survive, to keep going and be able to serve. This is where I call living with purpose and faith creates miracles but it requires surrender. When you are doing something that you are passionate about, then you are chasing emotional contentment and at some point on this street of failure and faith, a miracle of success takes birth. You have to surrender in order to render the service beyond WOW. This level of excellence will force to uplift not just yourself but everyone in your tribe. 6. Innovation for simplicity- We are living in the world where every few weeks new technology makes the old technology antique & outdated. But it’s the innovator, the one who gets to the market first becomes a leader and the rest turn into followers. If you are holding your ideas, your unique skills, then you are depriving not only yourself but your tribe. Now make no mistake, innovating demands failure beccause if you will not fall, you will not know the pain from falling and will not eventually create the medication for that pain. If it had not been the need for connecting his people, his tribe that Jan Koum felt and noticed early-on in his childhood, who knows if he had ever created WHATSAPP. Every failure brings you closer to your destiny. Keep it simple so anyone from a child to master can use it and work with it. As Jeff Bezos says, “"You have to be willing to be misunderstood if you’re going to innovate." 7. Time- When everyone is running to get something and often they are just running, no one asks for what? In order to achieve whatever be it, you are sacrificing your most precious possession. That is time. Why not turn around and follow and chase your heart, listen to your intuition as that is what the time wants you to be doing. As Steve Jobs said “Being the richest man in the cemetery doesn’t matter to me. Going to bed at night saying we’ve done something wonderful...that’s what matters to me.” Time is your strength. 9. Unknown territory- Every entrepreneur is an astronaut in a way as they start to explore that is unknown, in order to find out what’s beyond that unknown. But the fear of unknown is what disrupts the norm and you should start to do things that you know and as long as you keep figuring out, you will find your path. Become a hacker as it’s the hacking that forces companies and big businesses to make it better every day. As Mark Zuckerberg says, “The Hacker Way is an approach to building that involves continuous improvement and iteration. Hackers believe that something can always be better, and that nothing is ever complete." 10. Clarity of vision – It gives you a clear direction, a clear path on what are you actually trying to do. Where are, you going and why? If that is clear, then it is just bringing your dream team, the right people who understand your vision, your language and chime in. One PERSON who I believe mastered this game and who I truly admire and gave it all is Bill Gates. Quoting Bill Gates who says, “I failed in some subjects in exam, but my friend passed in all. Now he is an engineer in Microsoft and I am the owner of Microsoft.” I believe our education system is broken and it is not for entrepreneurs or leaders as it creates followers. If you want to be the disruptor, the change maker or the game changer, then you have to break the rules and create your own. As long as you know why you are doing it and what you want to create, you will fail, make many mistakes and even be criticized but it will take you somewhere as no one can guarantee success. If they do, then you are with the wrong people. Great minds don’t guarantee as they are risk-takers. Invincible passion talkshow shares powerful message and stories in its unique way with the sole purpose to empower your power.